In the last couple of months I have made a large amount of soup and stew recipes. While, my whole family enjoys these dishes, I figured it was about time for a change in my menu plan for the week. My oldest son has been going through a fruit stage where he is literally obsessed with any and every kind of fruit that he can find at the grocery store. I'm proud of his love for fruit, but my husband has less of an enthusiasm for getting in his daily fruit requirements. I fall somewhere in the middle of the debate. I grew up in Washington state and never understood that apple prices at the grocery store could be high until I moved to West Virginia. I remember picking wild blackberries by the community college in our area and eating a large amount of locally produced fruit. I never really thought about whether I liked or didn't like fruit in general. As an adult I haven't been as vigilant about making sure that I eat my daily requirement of fruit, so I recently have begun to try to find recipe using fruit as an ingredient, in an effort to make my family healthier and my oldest son happy. Recently, the September issue of Parents magazine had a recipe for Asian Burgers with Pineapple-Mango Salad, which looked like a perfect way to increase my family's fruit intake. This recipe has 14 ingredients. It serves six and takes approximately 15 minutes. I had no problems finding any of the ingredients at my local grocery store, with the exception that I substituted an English cucumber for the seedless variety specified in the recipe. I ground my own beef so that added 15 minutes to my overall preparation time. I chose not to add the parsley to the salad, my children can be picky about parsley in dishes and I knew that without it they would eat the fruit without complaints. I followed the remainder of the recipe as stated. The fruit salad was the most popular part of the recipe for my two boys. My husband and I loved the flavor of the burgers, but felt that they were very dry. I would suggest adding the hoisin mayonnaise from this earlier blog post of mine. I think the combination of the flavors would be delicious and add greatly to the overall recipe. With the stated modifications I think this could be a great dish. 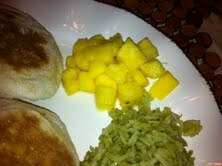 For the recipe go to Asian Burgers with Pineapple-Mango Salad. That is awesome that you ground your own beef!! I don't know about the cukes on the burgers, but the pineapple-mango salsa sounds yummy. This looks really delish!! Found your blog over at the 99% exposure blog hop. I'm now a follower!! I'm doing a "Shop My Closet" Giveaway over at my blog right now. I'd love for you to stop by. @Amy O Followed you back, have a great weekend! These look awesome! I make an interesting pork-apple burger with tropical "jam." I love finding new and unusual burger recipes. Thanks for posting! @Melissa Yum! The combo of the pork and apple sounds delicious! I love mixing meat and fruit, it makes for a great flavor combination.